James, the brother of the Lord, was largely portrayed as a prayerful man, and there is a slight emphasis on prayer in his book. His epistle was addressed to the twelve tribes scattered among the nations [James 1:1], and he wrote on a variety of topics regarding the Christian living. There are 54 commands in his 108 verses, as he urges his readers to do the Word of God. As he ends off his epistle, he turns to ideas of patience in suffering and faithful prayers at the same time. These are ideas preached by Paul as well, who encouraged in Romans, be joyful in hope, patient in affliction and faithful in prayer [Rom 12:12|Article]. In today’s study let us meditate on this simple instruction, which forms a simple cheat-sheet in life. Is anyone among you in trouble? – I can imagine, when they received this letter, one of the leaders would have stood in front of everybody and read it aloud, maybe? Imagine, then, when he reads this line. I bet the people were screaming a resounding, ‘yes! I am in trouble!’ Followers of the Lord are often in trouble. Peter says it plainly – Dear friends, do not be surprised at the fiery ordeal that has come on you to test you, as though something strange were happening to you [1 Peter 4:12|Article]. Paul also says – In fact, everyone who wants to live a godly life in Christ Jesus will be persecuted [2 Tim 3:12]. There is persecution – more so in the days of the early church than us today, more so today in certain regions than others. There are trials and difficulties in life. At the same time, believers are not freed from pain and ailments, diseases and death. We are always in trouble, whether by our own doing, or by the fault of men, or by supernatural forces or divine will. Let them pray – James immediately assume that, yes, there are people in trouble. It was an easy assumption to make. He too, was a man who had been through many troubles – at the end of his life, he was also martyred. Pray, James said. That was easy. You pray. It was something that the Israelites have been taught to do all throughout their history – when you are in trouble, pray and cry out to the Lord for redemption. That’s what the prophets did again and again. That’s what the psalmists did. That’s what King David did, and that’s what Moses did too. Job, in the midst of his suffering, constantly cried out to the Lord – then that person can pray to God and find favor with him, they will see God’s face and shout for joy; he will restore them to full well-being [Job 33:26]. Why do we pray in times of trouble? Job says, because God will restore us and bring us joy. The Psalmist makes it simpler – call on me in the day of trouble; I will deliver you, and you will honor me [Psa 50:15]. Jesus, too – And being in anguish, he prayed more earnestly [Luke 22:44]. Is anyone happy? – James makes a contrasting perspective immediately, as he jumps from troubles to joy. Again, it is a rhetorical question – there will obviously be some who were happy, and anyone of us will certainly come to experience various degrees of happiness at various points in our lives. This mention of happiness, however, is not only in stark contrast to the mention of trouble in the same verse, but it contrasts with the entire point of affliction that James had been making. This leads me to ponder, surely this isn’t just a random statement stuck in. There is likely a correlation here. In trouble? Pray. Prayed? You’ll find joy – like what Job said in Job 33:26, we will see God’s face and find hope, and with that hope that is in Lord Jesus, we can only rejoice. This corresponds with Paul’s Romans 12:12 – Be joyful in hope, patient in affliction and faithful in prayer. They all come together. Let them sing songs of praise – Don’t keep your happiness to yourself, don’t be secretly happy. Sing songs of praise, for God is the source of that happiness. Sing to him, sing praise to him; tell of all his wonderful acts [1 Chron 16:9]. Songs of praise are also a form of prayer, thanksgiving prayers in contrast to the earlier petition or intercessory prayers. Yet these prayers should all come together – they aren’t mutually exclusive. I hope we are able to read this verse not as an either-or situation. 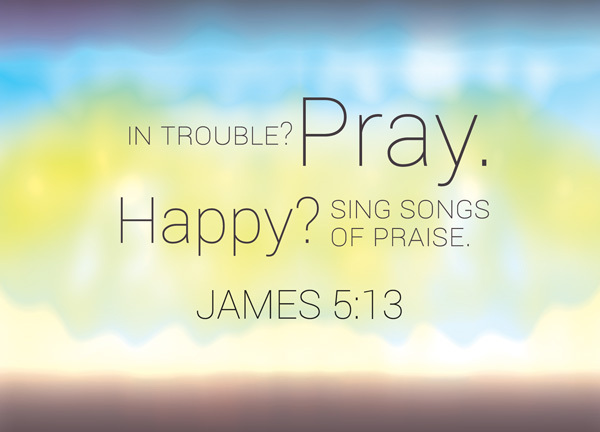 It doesn’t say, IF you are in trouble, pray, but if you are happy, sing songs of praise. Nope. Why? You may disagree, but I’m inclined to believe that a person can be troubled and yet happy at the same time. These emotions aren’t mutually exclusive, because we as humans are complex beings capable of feeling multiple emotions. And, even if a person is truly very troubled, with no joyous circumstances in life, upon praying, he will be reminded of who his Lord is, learn to put his hope in the Lord again, and as a result, gain joy. I imagine that if there is a self-help book, the book of James would be easily translated into its template. With so many advices and instructions on the Christian living, it makes it easier for us today to live out our faith. Having trouble in life? Flip flip flip, oh, I need to pray. Thinking about tomorrow? Flip to James 4. Reflecting on your choice of words, flip to James 3. Struggling with bias? James 2. Tempted? James 1. Obviously, there are 54 commands, and this list goes on and on. It’s really like a cheatsheet that you bring with you into the exam of life. Are these instructions complicated, or hard to understand? Truthfully, no, although many of them can be quite hard for some of us to practise. But perhaps the easiest to start with is always prayer. Indeed, in times of trouble, pray; in times of joy, sing songs of praise.